It’s still in the high 88’s here most days. We’re going to drop down to high 60’s tonight but it won’t last long. It’s such a bummer because I’ve been collecting some great outerwear pieces. That’s what I’m into right now despite the hot weather. I picked up this wool blend cocoon coat in the prettiest little shade of lavender. I mean…I travel and every time I’m left scrambling to buy or borrow a coat last-minute. That ends this year. I picked out this biker jacket because it reminds me of my babe *insert heart emoji here* . He loves that ribbed biker style. As soon as he saw these photos he commented on how nice the jacket is. All I could think was what about meeeeeee, do I look nice?! I’m a brat, what else is new. I can stop stealing his biker jacket now though…or not haha. I can’t wait to break it out tonight when the temperatures drop. 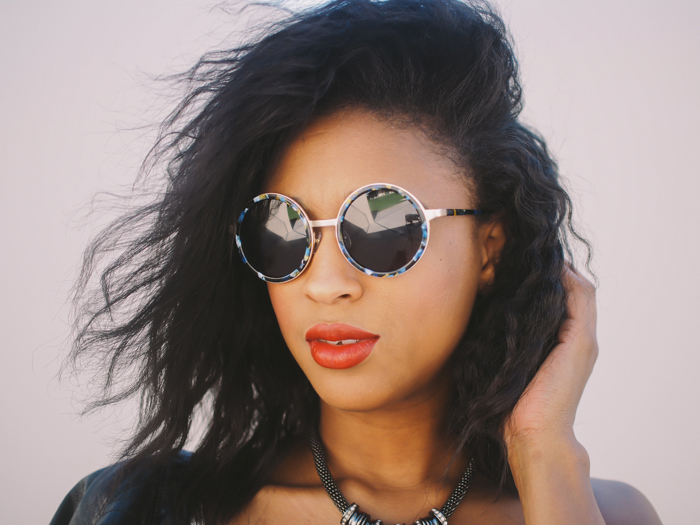 I’m totally smitten with these Raen sunglasses as well. You know I’m a sunglasses addict. These babies are polarized perfection. I love the vintage stained glass vibe they give. It was about 3 am last night when I decided to attempt a braid out on my hair. Sigh. It’s not perfect but I’ll get there. I need to find the ultimate companion product to help me get the job done. I could tell you were doing a braid out, and I ain’t mad at it. I like the crimped look. Next time, start a little earlier than 3am, lol, and try it on slightly wet hair. Loving the jacket too. This week it finally started to feel like fall in the Bay Area…I’m talking 70 degree weather. :) It’s been so long since I’ve lived in south Florida that I don’t even know when it starts to get “cold” there…December? Hopefully you can get good use out of your new coat before the month is over. Yeah my hair was dry, but I used a accompanying product to compensate for that. Think I just needed more time. It’s still hot as heck here. Today I was sweating and at the beach, some cold front. love everything about this style! I love the leather jacket! The boots are so badass, you look like a cute rockstar. You can never go wrong with a moto jacket in my book. I am so jealous that you can be wearing this outfit in mid October. I am visiting on Richmond now and believe me, Winter Is Coming! OMG!!! You are my obsession!